Una simple mirada a nuestros ocupados horarios nos muestra lo duro que puede ser encontrar un equilibrio bien razonado entre no hacer nada y hacerlo todo. Por eso el autor y pastor Kevin DeYoung trata de frente el problema de la actividad excesiva en su nuevo libro Súper ocupados, y no con el típico arsenal de consejos sobre la administración del tiempo, sino con las herramientas bíblicas que necesitamos para descubrir la causa del problema y eliminarlo de raíz. 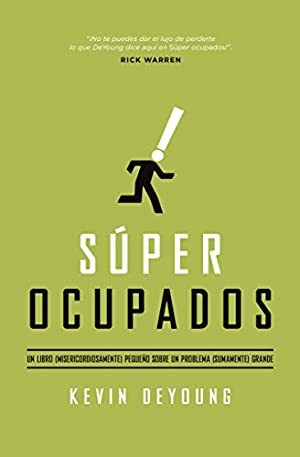 Este libro es muy práctico y súper corto. Te ayudará a poner fin al problema de estar demasiado ocupado. Just one look at our jam-packed schedules tells us how hard it can be to strike a well-reasoned balance between doing nothing and doing it all. That's why award-winning author and pastor Kevin DeYoung addresses the busyness problem head-on in his newest book, Crazy Busy -- and not with the typical arsenal of time management tips, but rather with the biblical tools we need to get to the source of the issue and pull the problem out by the roots. Highly practical and super short, Crazy Busy will help you put an end to "busyness as usual." We started tracking this book on June 19, 2017. The price of this book has changed 11 times in the past 674 days. The current price of this book is $5.38 last checked one hour ago. The lowest price to date was $3.99 last reached on October 30, 2018. The highest price to date was $6.99 last reached on June 19, 2017. We last verified the price of this book about one hour ago. At that time, the price was $5.38. This price is subject to change. The price displayed on the Amazon.com website at the time of purchase is the price you will pay for this book. Please confirm the price before making any purchases.